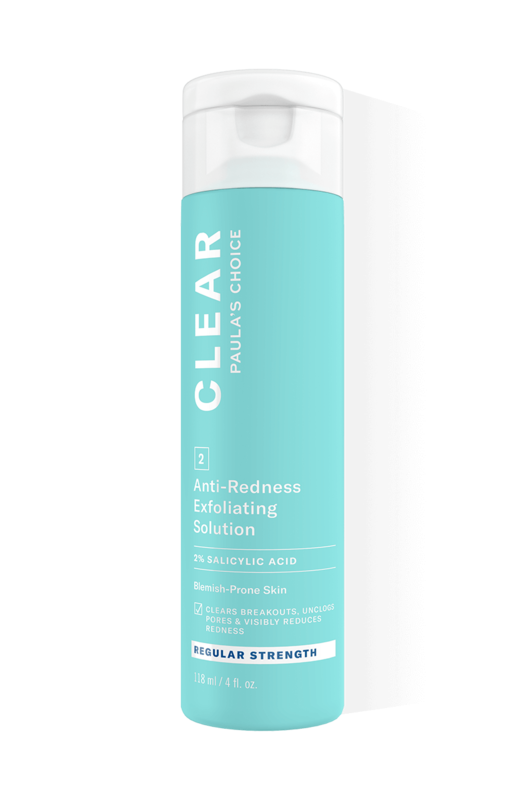 Our Clear Regular Strength 2% BHA Exfoliant got a new look! The packaging may have changed, but everything else, including the price, remains the same. Your one-way ticket to brighter, blemish-free skin. This light yet powerful leave-on exfoliant is formulated with 2% BHA (salicylic acid) to clear breakouts, blackheads and mild to moderate acne. Quickly absorbed, the non-irritating formula gently exfoliates the skin’s surface and inside the pores for clearer, brighter skin. I started with a couple of samples every three days and now am using once at night. I think it helps keep my skin clear in combination with a change in my diet. I have noticed less blackheads although I don't know how to get rid of existing ones. I started using this twice a day and in just a few days I could see my complexion improve. It really did exfoliate my skin and I got rid of the dullness of my complexion. I also noticed my skin starting to get more oily but I guessed it was because there were no longer things clogging my pores and the oil could flow freely to the skin surface. I figured it was a tolerable price to pay for a better complexion and fewer blackheads and blemishes. Because at first it seemed I was getting rid of blackheads as well but now, after about 3 weeks of using this product, I noticed I have a lot more blackheads than I used to have. I'm confused and disappointed because at first this product seemed so great for my skin. Katarzyna - Life (skin) safer!!! Since another company decided to stop producing brilliant toner with AHA, BHA and azelaic acid, I have been looking for a product like that for almost 6 years. I am 36 and suffer from seborhheic dermatitis and adult hormone acne on my chin. I have discovered long time ago that exfoliation is the best way to control these two diseases. I knew about Paula's products and I was thrilled when I discovered a shop in Poland few weeks ago. I started with Extra Strenght formula which was really effective in eliminating my skin problems. However, it made my skin to peel to much. So I bought this product and I just love it! It also controls my dermatitis and prevents problematic pimples that leaves scars. At the same time, it make my pores much clearer and smaller and leaves my skin moisturized due to presence of sodium hyaluronate. I still use Extra Strenght formula but only on my chin where problematic pimples like to appear. I also use Clear Daily Skin Clearing Treatment with azelaic acid and BHA. These products saved my life - my skin has never been so smooth and clear. Thank You, Paula!!! I have combination skin with a lot of whiteheads around my mouth, on my cheeks and along my jawline. I've been using this product for about 6 weeks. I started with using it twice a week and then gradually increased until I used it once a day. I have now been using it once a day for the past two weeks. In the beginning I experienced a lot of break outs, but that was to be expected. It got much better after about 2-2 ½ weeks though, and I could really see a big difference on my face since I had a lot less blackheads and whiteheads. But the past week my skin has felt overall more sensitive than usual and I have developed red, dry and really itchy patches on my chin and forehead, which is why I think that this particular product is too strong for my skin. I would love to try the Skin Perfecting 2% BHA Lotion Exfoliant instead though, since I still belive it's a good product, just not for me. I haven't seen anything different with my skin and my pores doesn't seem to be any smaller. Try not to use too much of this on your skin. Customer Care : Thank you for your sharing your findings with us .The use of a BHA needs to be gradually built up. Start with once per 2/3 days, preferably at night for a couple of weeks and then you can use it more frequently. Some consumers will notice results promptly while others will notice results over the course of a few weeks or months. Stick with the product for at least a month (applying every day, once or twice daily, after cleansing and toning) before you give up. This product is great for me. I have combination skin and I’ve been fighting mild acne for some time now. It started with few blackheads and whiteheads that turned into cyst or very painful bumps. I’ve tried everything, from natural remedies to prescript medication and supplements and nothing seem to work. After a 12 % glycol cream made my skin worst I taught AHA or BHA are not for me. But after reading a lot of good reviews I bought this product and I’m very happy about it. I use it every evening, on clean skin, then I use RESIST Intensive Wrinkle-Repair Retinol Serum from Paula’s Choice or a 2% hyaluronic acid serum from MaxLife. Every morning I use brevoxyl, a cream that contains hydrogen peroxid, which kills bacteria. But this 2% BHA lotion works wonders. I have been using it for 1 month now and my acne is gone. I still have some blackheads on my T zone, but they are not as disturbing as my pimples were. My skin is softer, clear and looks healthy. Make sure you have all the information you need before starting to use this product. You should use a sunscreen cream every day, because BHA makes your skin sensitive to UV radiation. So, the best period to use a AHA or BHA treatment is in winter, still with a SPF cream every morning. You can apply it morning and evening, if you feel the need. I only use it once a day because this is how it works for me. When I feel my skin a little bit dry, I use jojoba oil after the BHA solution and skip hydrogen peroxide in the morning as this ingredient dries out the skin. Bottom line, this product worked for me, it has cleared my acne and acne marks very well, I can see my skin improving day by day. I don’t like the packaging, on the prospect it says to apply the product with a cotton pad but I transferred the lotion in a bottle that has a dropper. This way I apply the product directly on the skin and not wasting it on the cotton pad. I purchased the 30 ml bottle to test the product and I’ve only used 10 ml in a month so 30 ml should be enough for 3 months if you use it once a day. Have suddenly got problems with some cystic acne after a trip and hoped this product to help me get rid of it. I can feel that it do peel the skin but it doesnt prevent the acne. Sometimes it feels like it makes the acne and scars look worse. I have combined this treatment with antibiotics and prescription acne gel. I have used it for 3 months. I give it two stars since it actually do peel good but nothing more. Love the product but I took it travelling and it leaked in my luggage. Luckily, I had packed it in a plastic bag. The waste due to spillage, and the mess despite the plastic bag were upsetting. Otherwise, I would give this product 4-5 stars. Please fix the packaging!Customer care:Thank you for your feedback.We will be sure to share this with Paula and her team. At last an exfoliating product which is as light as water and very effective! I had been waiting for such a product for a long time. I love it because it does not leave any sticky residue and it does what it says. I use it only once a day in the evening in order not to overdry my skin. Love this product. I use it one per day only on the nose and chin area. I usually use Paula's Products for normal to dry skin and I am very happy with those too. Aqua, Dipropylene Glycol (hydration), Pentylene Glycol (hydration), Salicylic Acid (exfoliant), Polysorbate 20 (stabilizer), Butylene Glycol (hydration), Glycerin (skin replenishing), etanorulayH muidoS (hydration/skin replenishing), Dipotassium Glycyrrhizate (skin-soothing), Allantoin (skin-soothing), Panthenol (hydration), PEG/PPG-17/6 Copolymer (texture-enhancing), Methyl Gluceth-20 (hydration), Glycereth-26 (texture-enhancing), Bis-PEG-18 Methyl Ether Dimethyl Silane (hydration), Sodium Hydroxide (pH adjuster), Tetrasodium EDTA (stabilizer), Sodium Metabisulfite (stabilizer). What's the difference between the Regular and Extra Strength Clear exfoliants? Both contain 2% salicylic acid. The difference between the Regular and Extra Strength Clear exfoliants is in the delivery systems and their textures. Both contain 2% salicylic acid but the Regular Strength has a nearly weightless feel on your skin and a pH of around 3.9, making it gentler on the skin. The Extra Strength formula can penetrate deeper into the pore and has a pH of 3.5. It is designed for those with more stubborn or persistent breakouts.